The Neva river has been called the main street of St Petersburg. Saint Petersburg listen (Russian: Санкт-Петербу́рг, Sankt-Peterburg) is a city located in northwestern Russia on the delta of the Neva River at the east end of the Gulf of Finland on the Baltic Sea. 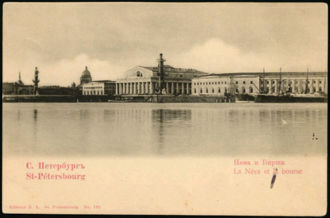 It is informally known as Piter (Питер) and was formerly known as Petrograd (Петрогра́д, 1914–1924) and Leningrad (Ленингра́д, 1924–1991). Founded by Tsar Peter the Great on May 16(27), 1703 as a “window to Europe,” it served as the capital of the Russian Empire for more than two hundred years. 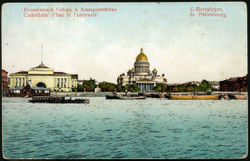 St. Petersburg ceased being the capital when the capital was moved to Moscow after the Russian Revolution of 1917. With about 4.7 million inhabitants (2002), today Saint Petersburg is Russia's second-largest city, Europe's fourth largest city, a major European cultural centre, and the most important Russian port on the Baltic. The city has a total area of 1439 square km, which makes it the second biggest city in terms of area among cities with over a million inhabitants in Europe, after London. It is 2 times bigger than New York City and 13 times bigger than Paris. Among cities of the world having populations of over one million people, Saint Petersburg is the northernmost. The city centre is a UNESCO World Heritage Site. For over 200 years Russia's political and cultural centre, the city is impressive even today, and is sometimes called "the Northern Capital" (северная столица, severnaya stolitsa). It is the administrative centre of Leningrad Oblast (itself a separate region) and of the Northwestern Federal District. The majestic appearance of St. Petersburg is achieved through a variety of architectural details including long, straight boulevards, vast spaces, gardens and parks, decorative wrought-iron fences, monuments and decorative sculptures. 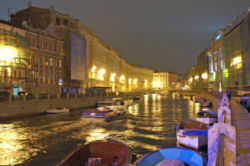 The Neva River itself, together with its many canals and their granite embankments and bridges gives the city a unique and striking ambience. These bodies of water led to St. Petersburg being given the name of " Venice of the North". St. Petersburg's position below the Arctic Circle, on the same latitude as nearby Helsinki, Stockholm, Aberdeen and Oslo (60° N), causes twilight to last all night in May, June and July. This celebrated phenomenon is known as the " white nights". The white nights are closely linked to another attraction — the eight drawbridges spanning the Neva. Tourists flock to see the bridges drawn and lowered again at night to allow shipping to pass up and down the river. Bridges open from May to late October according to a special schedule between approximately 2 a.m. and 4:30 a.m. The historical centre of St. Petersburg, sometimes called the outdoor museum of Neoclassicism, was the first Russian patrimony inscribed on the UNESCO list of World Heritage Sites. St. Petersburg has been known as the city of palaces. One of the earliest of these is the Summer Palace, a modest house built for Peter I in the Summer Garden (1710–1714). Much more imposing are the baroque residences of his associates, such as the Kikin Hall and the Menshikov Palace on the Neva Embankment, constructed from designs by Domenico Trezzini over the years 1710 to 1716. A residence adjacent to the Menshikov palace was redesigned for Peter II and now houses the State University. Probably the most illustrious of imperial palaces is the baroque Winter Palace (1754–1762), a huge building with dazzlingly luxurious interiors, now housing the Hermitage Museum. The same architect, Bartolomeo Rastrelli, was also responsible for three residences in the vicinity of the Nevsky Prospekt: the Stroganov palace (1752–1754, now a wax museum), the Vorontsov palace (1749–1757, now a military school), and the Anichkov Palace (1741–1750, many times rebuilt, now a palace for children). Other baroque palaces include the Sheremetev house on the Fontanka embankment (also called the Fountain House), and the Beloselsky-Belozersky Palace (1846–1848) on the Nevsky Prospekt, formerly a residence of the Grand Duke Sergey Aleksandrovich. The Hermitage Museum complex with the Winter Palace at right. Of Neoclassical palaces, the foremost is St Michael's (or Engineers') Castle, constructed for Emperor Paul in 1797–1801 to replace the earlier Summer Palace. The Tauride Palace of Prince Potemkin (1783–1789), situated nearby, used to be a seat of the first Russian parliament. Just to the left from the Hermitage buildings is the Marble Palace, commissioned by Count Orlov and built in 1768–1785 from various sorts of marble to a Neoclassical design by Antonio Rinaldi. The Michael Palace (1819–1825), famed for its opulent interiors and named after its first lodger, Grand Duke Mikhail Pavlovich, now houses the Russian Museum. Also built in the Neoclassical style are the Yusupov palace (the 1790s), where Rasputin was killed; the Razumovsky palace (1762–1766); the Shuvalov palace (1830–1838); and the Yelagin Palace (1818–1822), a sumptuous summer dacha of the imperial family, situated on the Yelagin Island. The last important residences were built for Nicholas I's children: the Mariinsky Palace (1839–1844), located just opposite St Isaac's Cathedral and housing a city council, the Nicholas Palace (1853–61), and the New Michael Palace (1857-1861). Most of the church buildings belong to the Russian government, since their seizure in 1917. The largest church in the city is St Isaac's Cathedral (1818–1858), one of the biggest domed buildings in the world, constructed for 40 years under supervision of its architect, Auguste de Montferrand. Another magnificent church in the Empire style is the Kazan Cathedral (1801–1811), situated on the Nevsky Prospekt and modeled after St Peter's, Vatican. No tourist can miss the Church of the Savior on Blood (1883–1907), a gorgeous monument in the old Russian style which marks the spot of Alexander II's assassination. The Peter and Paul Cathedral (1712–1732), a long-time symbol of the city, contains the sepulchers of Peter the Great and other Russian emperors. Apart from these four principal cathedrals, which operate today primarily as museums, there are numerous other churches. Of baroque structures, the grandest is the white-and-blue Smolny Convent (1748–1764), a striking design by Bartolomeo Rastrelli, but never completed. It is followed by the Naval Cathedral of St Nicholas (1753–1762), a lofty structure dedicated to the Russian Navy, the outside being covered with plaques to sailors lost at sea. The church of Sts Simeon and Anna (1731–1734), St Sampson Cathedral (1728–1740), St Pantaleon church (1735–1739), and St Andrew Cathedral (1764–1780) are all worth mentioning. The Neoclassical churches are too numerous to count. 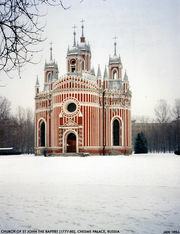 Many of them are intended to dominate vast squares, like St. Vladimir's Cathedral (1769–1789), not to be confused with the church of Our Lady of Vladimir (1761–1783). The Transfiguration Cathedral (1827–29) and the Trinity Cathedral (1828–1835, fire-damaged) were both designed by Vasily Stasov. Smaller churches include the Konyushennaya (1816–1823), also by Stasov, the "Easter Cake" church (1785–1787), noted for its droll appearance, St Catherine church on the Vasilievsky Island (1768–1771), and numerous non-Orthodox churches on the Nevsky Prospekt. The city has two small churches in the early Gothic Revival style, those of St John the Baptist (1776–1781) and the Chesmenskaya (1777–1780), both designed by Yury Velten. The late 19th-century and early 20th-century temples are all constructed from Russian Revival or Byzantine Revival designs. The cathedral mosque (1909–1920), reputedly the largest in Europe, is built after the model of Timurid temples in Samarkand. St Petersburg Buddhist temple was the first in Europe. Construction was funded by subscriptions of the Dalai Lama and Russian and Mongolian Buddhists; the structure was inaugurated in the presence of Itigilov in 1914 and served as a valuable resource to transient Buryats and Kalmyks during World War I. It functioned until 1935 when the lamas passed into gulags. The temple and its grounds were used for secular purposes until 1991, when the datsan was eventually reopened for worship. The Peter and Paul Fortress, formerly a political prison, occupies a dominant position in the centre of the city. A boardwalk was built along a portion of the fortress wall, giving visitors a clear view of the city across the river to the south. On the other bank of the Neva, the spit of the Vasilievsky island is graced by the former Bourse building (1805–1810), reminiscent of a classic Greek temple, with two great Rostral Columns, decorated with ships' prows, standing in front of it. Undoubtedly the most famous of St. Petersburg's museums is the Hermitage, one of the world's largest and richest collections of Western European art. Its vast holdings were originally exhibited in the Greek Revival building (1838–1852) by Leo von Klenze, now called the New Hermitage. But the first Russian museum was established by Peter the Great in the Kunstkammer, erected in 1718–1734 on the opposite bank of the Neva River and formerly a home to the Russian Academy of Sciences. Other popular tourist destinations include the Stieglitz Museum of Applied Arts (1885–1895), the Ethnography Museum (1900–1911), the Suvorov Museum of Military History (1901–1904), and the Political History Museum (1904–06). The city is adorned with numerous monuments from the imperial period of Russian history. 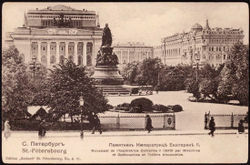 The imperial government institutions were housed in the General Staff building on the Palace Square (1820–1827), with a huge triumphal arch in the centre, the Senate and Synod buildings on the Senate Square (1827–1843), the Imperial Cabinet (1803–1805) and the City Duma (1784-87) on the Nevsky Prospekt, the Assignation Bank (1783–1790), the Customs Office (1829–1832), and the splendid Admiralty (1806–1823), one of the city's most conspicuous landmarks. Most of these buildings were designed either by Giacomo Quarenghi, or by Carlo Rossi. Some of the city shops and storehouses are landmarks in their own right. For example, the monumental New Holland Arch (1779–1787) and adjacent walls of the New Holland isle are occupied by commercial enterprises. The Merchant Court on the Nevsky Prospekt (1761–1785), also designed by Jean-Baptiste Vallin de la Mothe, houses the largest extant 18th-century supermarket in the world, as well as several coffee bars and a metro station. Nearby are the Circular Market, erected in 1785–1790, and the Passage, one of the great covered arcades of the mid-19th century. 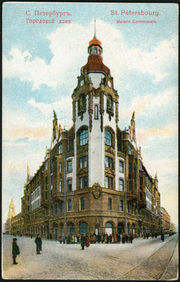 Other department stores, built in the majestic Art Nouveau style, line the Nevsky Prospekt and include the Eliseev emporium and the House of Books. St Petersburg is a home to many theatres. The oldest is the Hermitage Theatre, a private palatial theatre of Catherine the Great, still preserving the complex stage machinery of the 18th-century. The Alexandrine Theatre, built in 1828–1832 by Carlo Rossi, was named after the wife of Nicholas I. Much more famous outside Russia is the Mariinsky Theatre (formerly known as the Kirov Theatre of Opera and Ballet), which has been styled the capital of the world ballet. Also worthy of note is the Ciniselli Circus, one of the oldest circus buildings in the world. The city conservatory, the first in Russia, was opened in 1862 and bears the name of Nikolai Rimsky-Korsakov; its alumni include Tchaikovsky, Prokofiev, and Shostakovich. The Bronze Horseman comes to life and races the streets of St. Petersburg in more than one work of Russian fiction. St Isaac's Cathedral looms in the background. The Palace Square is dominated by the unique Alexander Column (1830–1834), the tallest of its kind in the world and so nicely set that no attachment to the base is needed. A striking monument to Generalissimo Suvorov, represented as a youthful god of war, was erected in 1801 on the Field of Mars, formerly used for military parades and popular festivities. 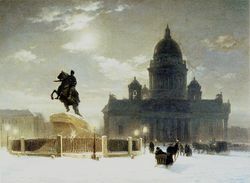 Saint Isaac's Square is graced by the Monument to Nicholas I (1856–1859), which was spared by Bolshevik authorities from destruction as the first equestrian statue in the world with merely two support points (the rear feet of the horse). The public monuments of St Petersburg also include Mikeshin's circular statue of Catherine II on the Nevsky Avenue, fine horse statues on the Anichkov Bridge, a Rodin-like equestrian statue of Alexander III by Paolo Troubetzkoy, and the Tercentenary monument presented by France in 2003 and installed on the Sennaya Square. Some of the most important events in the city's history are represented by particular monuments. The Russian victory over Napoleon, for example, was commemorated by the Narva Triumphal Gate (1827–1834), and the victory in the Russo-Turkish War, 1828-1829 — by the Moscow Triumphal Gates (1834–1838). Following this tradition, the Piskarevskoye Cemetery was opened in 1960 as a monument to the victims of the 900-Day Siege. St Petersburg is surrounded by imperial residences, some of which are inscribed in the World Heritage list. These include: Peterhof, with the Grand Peterhof Palace and glorious fountain cascades; Tsarskoe Selo, with the baroque Catherine Palace and the neoclassical Alexander Palace; and Pavlovsk, which contains a domed palace of Emperor Paul (1782–1786) and one of the largest English-style parks in Europe. Much of Peterhof and Tsarskoe Selo had to be restored after being dynamited by the retreating Germans in 1944. Other imperial residences have yet to be revived to their former glory. Gatchina, lying 45 km southwest of St Petersburg, retains a royal castle with 600 rooms surrounded by a park. Oranienbaum, founded by Prince Menshikov, features his spacious baroque residence and the sumptuously decorated Chinese palace. Strelna has a hunting lodge of Peter the Great and the reconstructed Constantine Palace, used for official summits of the Russian president with foreign leaders. Other notable suburbs are Shlisselburg, with a medieval fortress, and Kronstadt, with its 19th-century fortifications and naval monuments. Catherinehof, originally intended as a garden suburb, was engulfed by the city in the 19th century. Tsar Peter the Great founded the city on May 27 ( May 16, Old Style), 1703 after reconquering the Ingrian land from Sweden. He named it after his patron saint, the apostle Saint Peter. The original name of SanktPiterburh was actually an imitation of the pronunciation of Dutch Sint Petersburg; Peter had lived and studied in the Netherlands for quite some time. The Swedish fortress of Nyenskans and the city Nyen had formerly occupied the site, in the marshlands where the river Neva drains into the Gulf of Finland. Since construction began during a time of war, the new city's first building was a fortification. Known today as the Peter and Paul Fortress, it originally also bore the name of SanktPiterburh. It was laid down on Zaiachiy (Hare's) Island, just off the right bank of the Neva, a couple of miles inland from the Gulf. The marshland was drained and the city spread outward from the fortress under the supervision of German engineers whom Peter had invited to Russia. Peter forbade the construction of stone buildings in all of Russia outside of St Petersburg, so that all stonemasons would come to help build the new city. Serfs provided most of the labor for the project. According to one estimate, 30,000 died . "The most artificial city in the world", as Dostoevsky put it, was intended to become the new capital of Russia. By virtue of its position on an arm of the Baltic Sea, it was called by Pushkin a "window on Europe". It was also a base for Peter's navy, protected by the island fortress of Kronstadt, built soon after the city. Indeed, the first person to build a house in Saint Petersburg was Cornelis Cruys, commander of the Baltic Fleet. Inspired by example of Venice and Amsterdam, Peter the Great envisaged boats and coracles as principal means of transport in his city of canals. No permanent bridges across the Neva were allowed until 1850. In the course of the 18th and 19th centuries, Russia's elite built lavishly in the city, leaving many palaces that survive to this day. But the city also suffered from regular flooding. The worst such flood occurred in November 7, 1824, when the water level rose 4.21 meters above normal. 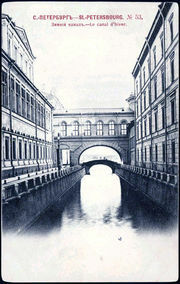 The playwright Alexander Griboyedov wrote, "The embankments of the various canals had disappeared and all the canals had united into one. Hundred-year-old trees in the Summer Garden were ripped from the ground and lying in rows, roots upward." When the waters receded 569 dead bodies were found, with thousands more injured or made ill, and more than 300 buildings had been washed away. The 1824 inundation is the setting for Alexander Pushkin's famous poem, The Bronze Horseman (1834). Other disastrous floods took place in 1777 and 1924. 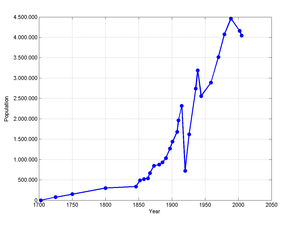 With the growth of industry, radical movements were also astir. Socialist organizations were responsible for the assassinations of many royal officials, including that of Alexander II in 1881. The Revolution of 1905 began here and spread rapidly into the provinces. During World War I, the name Sankt Peterburg was seen to be too German and, on the initiative of Tsar Nicholas II, the city was renamed Petrograd on August 31 ( August 18, Old Style), 1914. Preserved as a museum ship in St. Petersburg, the Aurora became a symbol of the October Revolution in Russia. 1917 saw the beginnings of the Russian Revolution. The first step (the February Revolution) was the removal of the Tsarist government and the establishment of two centers of political power, the Provisional government and the Petrograd Soviet. The Provisional government was overthrown in the October Revolution, and the Russian Civil War broke out. The city's proximity to anti-revolutionary armies, and generally unstable political climate, forced Bolshevik leader Vladimir Lenin to flee to Russia's historic former capital at Moscow on March 5, 1918. The move may have been intended as temporary (it was certainly portrayed as such), but Moscow has remained the capital ever since. On January 24, 1924, three days after Lenin's death, Petrograd was renamed Leningrad in his honour. The central committee's reason for renaming the city again was that Lenin had led the October revolution. 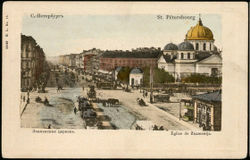 Deeper reasons existed at the level of political symbolism: Saint Petersburg had stood as the head of the Tsarist empire. After Moscow it was the largest city and the change gave great prestige to Lenin. The renaming to Leningrad emphatically symbolised the upheaval that had occurred to the social and political system. During World War II, Leningrad was surrounded and besieged by the German Wehrmacht in the Siege of Leningrad from September 8, 1941, until January 27, 1944, a total of twenty-nine months. A " Road of Life" was established over Lake Ladoga (frozen for a large part of the year), but it was open to airstrikes; only one out of three supply trucks that embarked on the journey reached its destination. Another route was opened on January 18, 1943 after the Red Army had succeeded in securing a narrow break-through of the Wehrmacht encirclement of the city. Some 800,000 of the city's 3,000,000 inhabitants are estimated to have perished. For the heroic tenacity of the city's population, Leningrad became the first Soviet city to be awarded the title Hero City. After the collapse of the Soviet Union, a bare majority (54%) of the population agreed to restore "the original name, Saint Petersburg," on September 6, 1991 (see above). As well as the city, 39 streets, six bridges, three Saint Petersburg Metro stations and six parks were renamed. Nevertheless, some, especially older people, still use the old names and, for example, use the old addresses on letters. 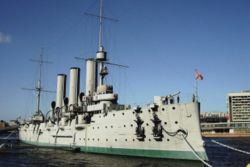 The name releases positive associations particularly in connection with the siege - so that on holidays even authorities call places connected with World War II "Hero city Leningrad". Among young people the name Leningrad seems to be a vague protest against the new society. One of the most successful bands in Russia, a Ska punk band from Saint Petersburg, called themselves Leningrad (not to be confused with Leningrad Cowboys from Finland). According to the 2002 Census, St. Petersburg had 4,661,219 inhabitants. That amounts to roughly 3.2% of the population of Russia as a whole. It is the second largest city in Russia, after Moscow. The International Labour Organization (ILO) estimates there are up to 16,000 children living on the street (as of 2000). According to the 2002 Census, the city's prevailing nationalities are Russians (84.7%), Ukrainians (1.9%), Belarusians (1.2%), as well as substantial numbers of Jews, Tatars, Chuvash, and people from Caucasus (many of whom are illegal immigrants). As for religions most are Russian Orthodox; many others are atheist. The following charts show the numbers of inhabitants. Until 1944 these were mostly estimates, but the figures for 1959 to 2002 come from census returns, and the figure for 2005 is an estimate. 7.9% of the population did not state their nationality during the Census. The city is a major centre of machine building, including power equipment, machinery, shipyards, instrument manufacture, ferrous and nonferrous metallurgy (production of aluminium alloys), chemicals, printing, and one of the major ports of the Baltic Sea. Toyota is building its plant in one of the suburbs; General Motors and Nissan have signed the deals with the Russian government too. 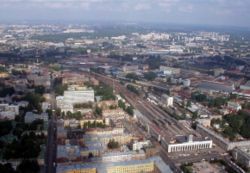 In 2006 Saint-Petersburg's budget reached volume of more than $6 billion and planned to reach $8 billion by 2008. The city is a major transport hub. It is the centre of the local road and railway system, and has a seaport (in the Gulf of Finland of the Baltic Sea) and river ports (in the Neva delta). It is the terminus of the Volga-Baltic Waterway which links the Baltic with the Black Sea. The St Petersburg Dam (currently under construction) will complete a ring road around the city. The city has five major railway stations serving various directions: Baltiysky Rail Terminal, Vitebsky Rail Terminal, Ladozhsky Rail Terminal, Moskovsky Rail Terminal and Finlyandsky Rail Terminal. Until recently, the Varshavsky Rail Terminal served as another major station, however, it has been closed down and converted into a railway museum. 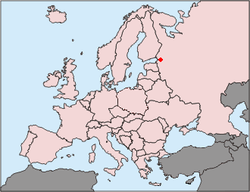 Saint Petersburg has daily international railway connections to Helsinki, Finland via Vyborg (on the Russian side) and Kouvola and Lahti (on the Finnish side). Two Russian trains - the Repin and the Tolstoi - as well as the Finnish Sibelius operate exclusively on this route (although Tolstoi continues to Moscow). The journey to Helsinki takes just over 5 hours including the time used for border control and customs. The city is served by Pulkovo Airport, which carries both domestic and international flights. Saint Petersburg has an extensive public transport system, including the tramway network that is considered the world's largest by track length. The Saint Petersburg Metro ( subway/underground) system began operation in 1955, and some of its stations are a tourist attraction on their own. The city has numerous islands on which many historically important parts of the city are located. Vasilyevsky island is the largest of them and forms the whole Vasileostrovsky Administrative District. Petrogradsky, Petrovsky, Aptekarsky, Krestovsky, Yelagin, and Kamenny islands form Petrogradsky Administrative District. St. Petersburg has always been known for its high-quality cultural life. Among the city's more than forty theaters is the world-famous Kirov Theatre (known now by its pre-revolution name of Mariinsky Theatre), home to the Kirov Ballet company and first-class ballet and opera. The St. Petersburg Philharmonic Orchestra is one of the best in Russia. The Russian composer Dmitri Shostakovich, who was born in St. Petersburg, dedicated his Seventh Symphony to the city, calling it the "Leningrad Symphony." He wrote the symphony during the German siege of the city in 1941. St. Petersburg has also been home to the newest movements in modern music. For example, in 1972 mathematics student Boris Grebenshchikov founded the band Aquarium, an underground rock group that grew to huge popularity in the 70s and 80s. St. Petersburg was similarly home to Kino, headed by the legendary Viktor Tsoi. Since then the "Piter's rock" music style was formed. Today's St. Petersburg boasts many pioneering musicians, from Leningrad's Sergei Shnurov to the group Tequilajazzz. St. Petersburg also features on Billy Joel's 1989 album Storm Front in Track 7 titled 'Leningrad'. 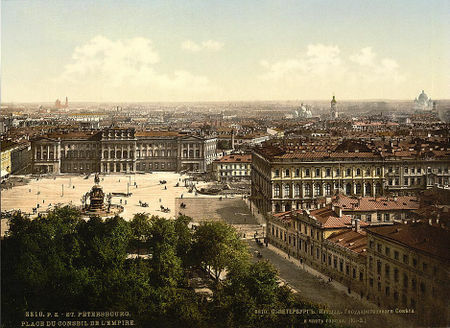 Skyline of St Petersburg in the 19th century, seen from St Isaac's Cathedral. The end of the cultural predominance of St. Petersburg coincided with Moscow's being chosen as the new capital and the dawn of film industry in Russia. Few films achieved international acclaim and international productions from Western countries couldn't film there. Lenfilm was the Soviet film studio based in St. Petersburg; however, films that became known internationally were often based on famous literary works, such as a few versions of Anna Karenina (a Russian and a French film, each of 1911; the first Western Anna Karenina has been shot in Petersburg after the end of communism) or of Fyodor Dostoevsky's The Idiot (the first one, Russian, in 1910). Several films deal with the complex history of the city many of which have propagandistic purposes. Outstanding is the film Noi Vivi (Italy, 1942; see Noi Vivi at IMDB), based on the novel We the Living by Ayn Rand, a film that comments on Italian politics by way of featuring the October Revolution. Anastasia has been shot several times, and especially famous is the 1956 version casting Ingrid Bergman; Warner Brothers also set a 1997 musical in the city. Giuseppe Tornatore planned a film about the Siege of Leningrad in 2005. The Russian Ark, shot in the Winter Palace (now the Russian State Hermitage Museum), let the audience meet various real and fictional personages from 300 years of Russian history up till the present. Der Untergang was also filmed in Petersburg because of similarities of the historical city centre and the centre of Berlin of 1945. St. Petersburg also is seen in Interdevochka (also Интердевочка or Intergirl) by Pyotr Todorovsky in 1989 featuring impressive shots of the city. The cult comedy Irony of Fate (Cyrillic: Ирония судьбы, или С лёгким паром!) even if mostly shot at Cheremushki, Moscow) plays in St. Petersburg and pokes fun at Soviet city planning. Fiction movies include GoldenEye (1995) or the action movie Midnight in St. Petersburg (UK, 1996). Onegin (1999 featuring Liv Tyler) is based on the Pushkin poem and showcases many tourist attractions. The Stroll (2003) by Aleksei Uchitel featured many attractions of the city with Irina Pegova playing the role of a mysterious, well endowed and enchanting Russian beauty. Two Brothers and A Bride (2002), originally titled A Foreign Affair and starring David Arquette, is a comedy about brothers seeking a mail order bride in St. Petersburg and end up finding much more. The International Film Festival in Saint Petersburg has been held annually since its inauguration in 1993 during the White Nights. It was said that St. Petersburg was the head of the Russian Empire, whereas Moscow was its heart. "The most deliberate city in the world," Dostoyevsky called it, emphasizing its artificiality. But it was also a symbol of modern disorder in a changing Russia. It frequently appeared to Russian writers as a menacing and unhuman mechanism. The grotesque and often nightmarish image of the city is featured in Pushkin's last poems, the Petersburg stories of Gogol, the novels of Dostoyevsky, the verse of Alexander Blok and Osip Mandelshtam, and in the symbolist novel Petersburg (by Andrey Bely). Numerous Russian and international aristocrats, politicians, artists, and scientists were born and/or have lived in Saint Petersburg. These include many of the Russian emperors; the novelists Fyodor Dostoyevsky, Ayn Rand, and Vladimir Nabokov; the composers Modest Mussorgsky, Pyotr Ilyich Tchaikovsky, Igor Stravinsky, Dmitri Shostakovich, and Nikolai Rimsky-Korsakov; the painters James McNeill Whistler and Kazimir Malevich; the scientists Leonhard Euler, Mikhail Lomonosov, Heinrich Schliemann and Alfred Nobel; the ballet dancers Vaslav Nijinsky, Anna Pavlova, George Balanchine and Rudolf Nureyev; the mathematician Grigori Perelman; and the politicians Ignaz Aurelius Fessler, Gustaf Emil Mannerheim, and Vladimir Putin. Saint Petersburg has long been a centre of education in Russia.